The biceps brachii, or biceps, is a two-headed muscle consisting of the long head and short head. Both heads originate on the scapula and attach to the forearm. The long head is the outer head of the biceps, the development of which provides the biceps peak much desired by bodybuilders. 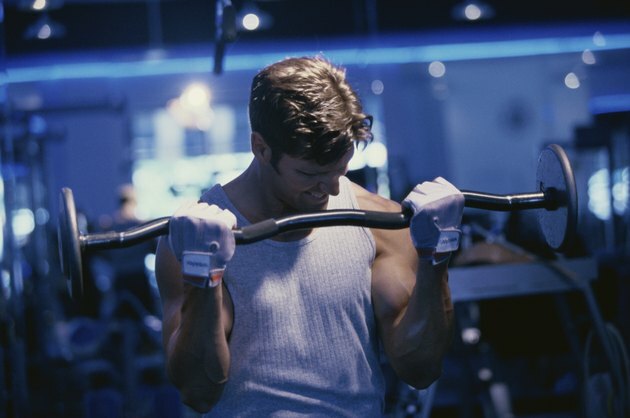 Most biceps exercises or pulling movements work both heads, but some emphasize the long head. The biceps are exercised when you do exercises that target your latissimus dorsi muscles, known as the lats or upper back. These exercises involve pulling movements and include pull-ups, bent-over rows, T bar rows, row pulls, lat pull-downs and single arm rows. The biceps are a relatively small muscle, which are involved in a lot of movements in the gym. Do not over train them by focusing too much on individual heads, such as the long head, or by an excessive number of direct biceps exercises. Set an incline bench to approximately 45 degrees. Grasp a pair of dumbbells, and sit back on the bench with your arms down by your side and your palms facing inward. Curl the left-hand dumbbell up while rotating your wrist so that at the top of the movement your palm is facing you. Lower your arm to your starting position, and repeat the movement with the right-hand dumbbell. Do a total of 12 to 20 repetitions. Keep your shoulders still while doing this exercise, and employ only elbow flexion. Grasp a barbell and position yourself on a preacher curl bench. Place your elbows on the bench, and extend your arms fully, ensuring your upper arms maintain firm contact with the bench. Curl the barbell up and tense your biceps at the top of the movement. Return to your starting position, and do 10 to 12 repetitions. Sit on the edge of a bench. Lean forward, and grasp a dumbbell with your left arm. Rest your elbow on the inside of your thigh. Keep your elbow pressed against your thigh, and curl the dumbbell until your bicep is fully contracted. Straighten your arm, and repeat the movement for 12 to 15 reps. Switch to your right arm, and repeat the exercise. Concentration curls isolate your biceps, focus on the long head and will help you get a bicep peak.